Make your floor unique by adding a custom logo! Custom seamless flooring is what we’re all about here at Hardscapes. 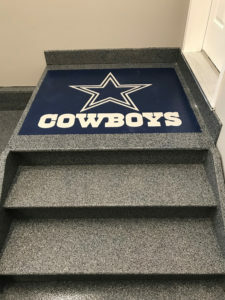 We can create uniquely original floors by incorporating logos, decorative graphics & branding colours – perfect for retail, hospitals, lobbies, schools, restaurants, showrooms, garages and even your man-cave! From reproducing logos and graphics to helping you bring your own idea(s) to life, we can help. You choose from unlimited colours and design options and we use our expertise, techniques, specialty products and equipment to create your one-of-a-kind flooring masterpiece! Throw some flare into your personal, residential, commercial or industrial space! Your truly custom concrete flooring project starts with a call to Hardscapes at 403-547-5597. Check out our portfolio. It showcases some our work, but is by no means a comprehensive list! « Cracks in your concrete surfaces looking a little unsightly?